Cancun and the surrounding areas offer loads of adventures. From zip-lining to snorkeling to off-roading they have a little bit of everything. Here are some of the best adrenaline pumping activities in Cancun! For an epic family adventure, head down to Quintana Roo. Quintana Roo is the Mexican state on the Caribbean coast encompassing some of the best cities in Mexico, including Cancun, Cozumel, Playa del Carmen, Tulum, Isla Mujeres, Costa Mujeres, and Puerto Morelos. Between these cities, there is almost every type of experience imaginable. Luxury spas, theme parks, animal encounters, extreme adventure, and of course some of the most beautiful beaches in the world. To fully experience the area plan to stay a minimum of 5 days. 5 days will allow you enough time to enjoy much of what Quintana Roo has to offer. If you can stay longer, that’s even better. Our last trip was seven days and I felt that it was not long enough. I recommend doing only one activity a day. If you do an activity one day, take the next day off for a day of beach bumming. You’re on vacation, so don’t run yourself ragged! No matter what you decide to do, remember to bring a bottle of water for each person. Mexico is hot! I finally took my kids to Mexico and it was the best time ever! There is basically an endless amount of fun to be had every day! Not to mention hundreds of places to stay that will accommodate any budget. If you can afford it, stay at an all-inclusive resort. It’s always nice to dine at lots of restaurants and not worry about the cost because it’s all included. I recommend The Grand at Moon Palace in Cancun or Grand Velas in Riviera Maya. Grand Velas Riviera Maya has an extensive kid’s club and a ton of baby amenities. The Grand at Moon Palace has loads of kid perks like a water park and a Flo rider! Parents will love the decadent on-site spa, Awe, at The Grand. If you prefer to stay off the beaten path head north to Riu Costa Mujeres. In Cozumel I recommend staying at Allegro Cozumel. On this last trip our family went looking for adventure and boy did we find it! After swimming through caves, zip lining, off-roading, rappeling and more we are ready to share our favorite things to do in Cancun with you! Selvatica which literally means: “pertaining to the jungle”, has been a fertile campground to explorers and adventurers from many bygone eras. These days, Selvatica is one of the world’s top adventure parks and perfect for families! Head over there for the most adrenaline pumping adventure of your life. 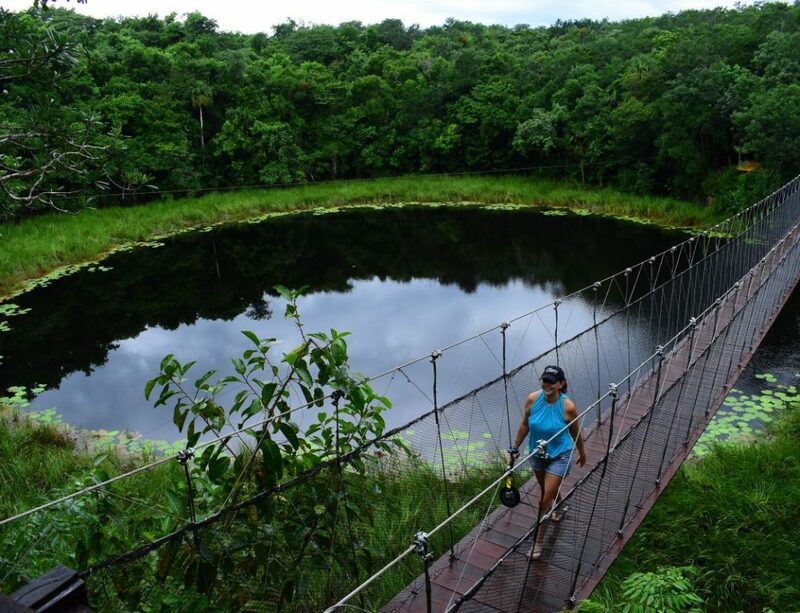 While you are here you will do various types of adventure activities like zip lines, swim in a cenote, off-road through a mud track, and more. Your day starts early when they pick you up from your hotel. Depending on where you are staying it can take up to an hour to drive there. Once you arrive you are in for 5.5 hours of fun. Buy Tickets: Selvatica averages $99 per person, but it depends on how much or how little you want to do. I recommend getting the “Gimme All” package. This package is $139 for an adult and $69 for kids. This is what we did and it was wonderful. What you need to bring: beach towel, swim suit to change into, camera, driver’s license. Things to know: You will not have cell phone service while out here. They allow you to use a GoPro. Half way through your day they will give you a sandwich. Once you are done with all the activities you are given a small meal. I recommend purchasing their photo package. Pac Chen is a neat adventure that kicks off with a Mayan blessing to protect you during your activities and on your trip home. Here you will partake in kayaking, multiple zip lines, and you will go rappelling into a cave. Once you are in the cave you get to enjoy swimming in a cenote. They also provide an authentic Mayan lunch that is out of this world good. If you’ve never had Mayan food you are in for a real treat! Buy Tickets: This tour is part of a Coba tour with All Tour Native. Tickets cost $139 and include transportation. What you need to bring: Beach towel, swimsuit, dry clothes to change into once you are done, GoPro or other water proof camera and organic sunscreen. Things to Know: Keep in mind that in order to participate in all the activities children must be 6 years old.Read my post about Pac Chen to learn more. I also put together a video of our time at Pac Chen. Chances are high you’ve never had an experience quite like the one you will have at Xplor. Just the main structure alone is phenomenal. You can visit Xplor during day or night, both are completely family friendly. The admission price includes all the activities and meals. 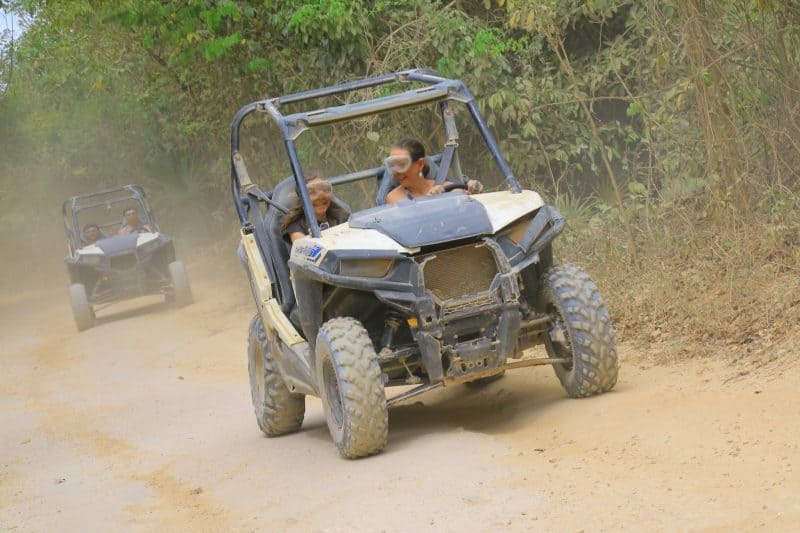 Activities include off-roading jeeps, extensive zip lines, swimming in caves through underground rivers, and much more. They have snack and drink stops around the park and dinner is a generous buffet. If you need some downtime, you can kick back in the sandy area in a hammock. Buy Tickets: Tickets start out at $63 per person. What you need to bring: Beach towel, swimsuit, driver’s license if you are 18 years or older, dry clothes to change into once you are done, GoPro or other water proof camera and organic sunscreen. Things to Know: You are given a locker to keep your things in and they have changing rooms. They provide you with a life jacket for the river swim. Río Secreto could very well be one of the great world wonders. Experience this stunning underground river with thousands of dramatic stalactites and stalagmites. It’s like stepping back in time to witness something mysterious and truly spectacular. Once you enter the cave, it’s completely dark except for your helmet light. You will walk and swim through the cave. Unfortunately, they will not allow you to take your own photos or videos in the cave, so you will have to purchase photos. Granted, it’s completely black without the lights on, so you would need a pretty substantial camera to take your own photos. After you are finished in the cave they take you to a buffet to eat. Buy Tickets: Rio Secreto costs $79 and includes food and drinks. If you need transportation that is an additional fee. Things to know: They provide you with a helmet, wetsuit, life jacket, and water shoes. You are given a locker to keep your things in and they have changing rooms. You have to wear the wetsuit. What you need to bring: Beach towel and swimsuit to change into. Ventura Park is a combination of an amusement park and the Wet n Wild water park. Teens especially will enjoy the ropes course, zip lines, go-karts, wave pool, and a bungee swing. Parents will enjoy the lazy river and cocktails and everyone will enjoy the arcade with 3D games. For an extra fee, you can swim with dolphins on the other side of the park. Buy Tickets: Tickets start at $39. You can add on different types of options like the buffet or drinks. What you need to bring: beach towel, swim suit to change into, and camera. Things to know: You are allowed to use a GoPro. You might want to bring water shoes. In case you need a good laugh, here’s a video of me being pushed of the bungee swing and screaming bloody murder. Aquarium Cancun is another fun place for families, located in the hotel zone at La Isla Shopping Village, and home to 140 different species. Here you can learn about sea life, touch stingrays swim with dolphins and go on an underwater Sea Trek. A Sea Trek is where they put that great big helmet on you and you can walk around underwater. Near the aquarium is the La Gran Rouda Ferris Wheel with epic views of Cancun. You can purchase an admission that gets you into the aquarium and the Ferris wheel for one price. Costs: It is $65 to do the Sea Trek. Things to know: They provide you with a wetsuit and water shoes. They have an underwater photographer that will take your photos. This activity is not safe for someone with epilepsy. Here is a video of my Sea Trek experience. You should not visit here without visiting some Mayan Ruins. This is the perfect opportunity to educate children Quintana Roo’s rich history and culture. At Coba, which once was home to 50,000 Mayans, you can climb to the top of a Mayan temple 42 meters high and see what remains of the ancient Mayan city. It is a long walk back to the temple you can climb up, so rent a bicycle for a $1 and bike through the ruins. Costs: It is super cheap to get in. The entrance fee is $38 pesos, under $3.50 USD. You may have to pay another 50 pesos to park your car in their parking lot. If you do a tour, then the costs start our around $68 USD. I went on an excellent tour with All Tour Native that included Coba and Pac Chen for $129. Things to know: Wear tennis shoes. You can climb the pyramid in the pouring rain. I know, because that’s what I did! Read my post on the Coba Mayan Ruins to learn more! The Tulum ruins is another site that’s worth a visit if you have time. The views here are magnificent. Unlike Coba, you cannot climb up any or ride a bike around. Their two beaches more than make up for it. Read my post on the Tulum Ruins for more details. Want to know about even more Mayan Ruins like Chichen Itza? 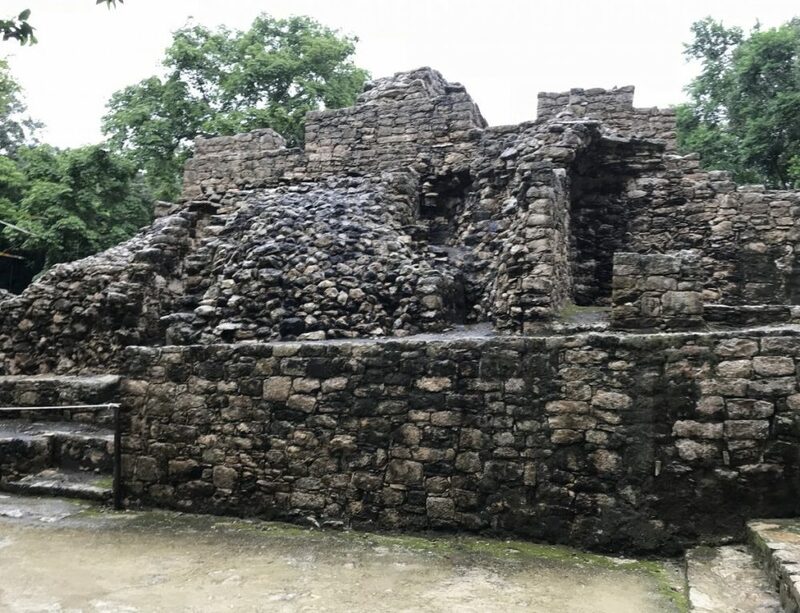 Read this post for lots more on Mexico’s Mayan Ruins! Imagine walking alone in complete darkness to navigate your way through a series of different ecosystems, using only the feel of the plants brushing against your sides and the floor of a beach, forest, and the walls of a cave to guide your way. That is just one of the many experiences you incur at Xenses, one of the fabulous parks in the wildly popular Xcaret brand. Xenses was designed to test and have fun with all of your senses. Not only is it interesting and tons of fun, but I also had one of the best quesadillas I’ve ever eaten underneath an umbrella sky. If you’re looking for a unique, one of a kind experience, then head to Xenses for the day. Buy Xenses Tickets: Tickets start out at $63 per person. Things to know: There is a point where you are alone in the dark for 15 minutes. If you have a medical condition like epilepsy do not do this. If you have time, catch a ferry and head over to Cozumel. The Winjet ferry runs between Playa Del Carmen every hour. 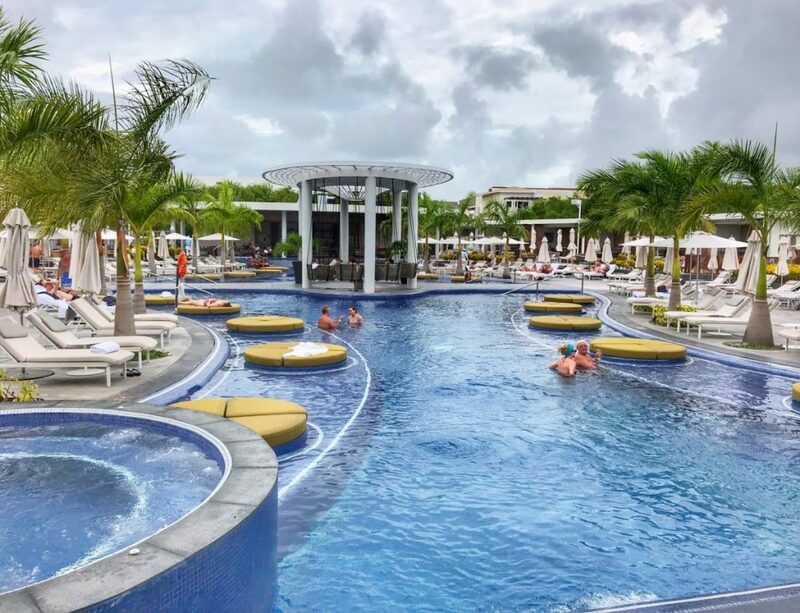 Once you get to Cozumel there are many more things to do including visiting a planetarium, hands on learning about Mayans, beach clubs, and more. The Cha´an Ka´an planetarium is a scientific, technological and cultural complex that provides outreach to society through science. Cha´an Ka´an has the most sophisticated planetarium dome in the country. From the name, which means “to observe” or “to enjoy the sky”. Cha´an Ka´an has the first and only planetarium in Latin America with 3D full dome. For kids there are interactive exhibits and games. We visited at night when there was an opportunity to look at the stars. Depending on when you are in town you will be able to see the Milky Way! All around this was an amazing experience. We learned a ton about the stars and Mayan astrology. Punta Sur is a park in Cozumel great for families with two lighthouses, Mayan ruins, a lagoon full of crocodiles, a beach club, and much more! The Mayan temple “El Caracol” is absolutely fascinating. When you take your kids into the little Navigation Museum under the lighthouse make sure you ask for an exclamation on this Mayan lighthouse. It will blow your mind! You also should go up in the lighthouse for epic views of the park! You can take a boat tour of the Colombia lagoon and look for crocodiles! No matter what you do, spend some time enjoying the gorgeous white sand on their beaches. Playa Mia is one of Cozumel’s grandest beach clubs. 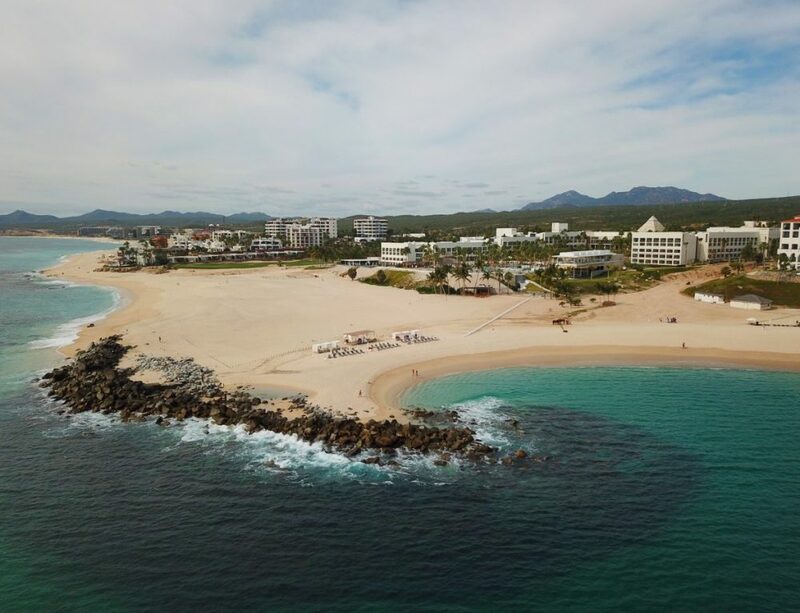 You can soak up the sun, surrounded by complimentary activities and beach toys, authentic cuisine and soothing spa treatments. Explore the cultural sights and sounds of Mexico with tours celebrating tequila, chocolate and other local flavors. Swim along Cozumel’s coral reefs on a snorkel tour. Feel your heart race as you plunge down our 200-foot long Twin Twisters water slides. Set your kids free to become pirates at Buccaneer’s Bay. Or kick back under a shady palm on our beach or at our own swim-up pool bar and restaurant. Buy Tickets: Tickets start out at $39 for a day pass. What to Bring: Swimsuit and sunscreen. An interactive pre-Hispanic town where you can experience the Mayas real life taking a trip back in time. Discover the story through the corn, caco, feather art and heneque in this unique place where the dance, music and incense are one together. As you move from hut to hut you will learn how gum is made, participate in chocolate making, and make your own tortillas. As a mom this is my ideal activity, it’s interesting, it’s hands on, and the kids learned a ton. Here is a video I put together to give you an idea of what to expect at Pueblo Del Maiz. Mr. Sanchos is a beach club in Cozumel on a gorgeous stretch of beach. They have a little something for everyone in the family, from the youngest to the oldest. For the adventurous, there’s para-sailing, atvs, scuba diving, and jet skiing. For those that enjoy a more low key beach day they have hammocks, snorkeling, and horseback riding. Buy Tickets: Day passes start out at $35. Now there are many more things to do in Cancun, but these are our favorites. I hope you love them as much as we did! Should You Get Travel Insurance? Don’t forget travel insurance! I’m a fan of Travelex insurance, because of the variety of options. Protect yourself from possible injury & theft abroad. I have gotten extremely sick twice now out of the country and Noah has had seizures in other countries, so I always recommend getting some sort of coverage. Read more about why you should always carry travel insurance here. If you are looking for a car rental I recommend getting the car at the Cancun Airport. It will make things easier. This entire area is easy to drive around in. Get a Cancun car rental for $11 a day!